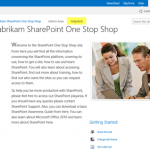 SharePoint Look Book site is an awesome web site having pictures on example modern portals build with SharePoint Online. These designs demonstrate what’s possible with the modern SharePoint and we will be releasing updated guidance on the Look Book also in future. Having example pictures and written clarifications of the structures around the sites built with modern SharePoint is great, but wouldn’t it be even more awesome if you could provision actual site collections and structures based on those designs so that you can even adjust those based on your needs?